Having transcended through various echelons of development, Orissa has not compromised on its gifted scenic beauty. From the elegant mountains to the rippling sea waters, Orissa is the perfect destination to quest your thirst for wanderlust. Also, renowned for its religious significance, the state is a popular pilgrimage destination, of which the Sun Temple is ubiquitously famous and has been recognized by UNESCO as a World Heritage Site. Be mesmerized by the elegant folkdance Odissi or delve into the delectable crabs and prawns, Orissa has much to offer than just picturesque natural beauty. Apart from being classified as one of the most important temple cities in India, Konark boasts of having created a good artistic influence. The annual Konark Dance in the backdrop of the majestic Konark Sun Temple, creating an enchanting ambience reverberating with the beating of drums and musical instruments, causes an accelerated influx of tourists from all over the world, who specifically visit the city during the month of December when the festival is held. The Handicraft exhibition gives tourists a chance to experience the beautiful artifacts created by the virtuosos of the trade, and the Craft Mela makes for a delightful shopping extravagance. Konark also has some impressive beaches, but if you really are exclusively inclined towards beaches it is Puri that you must visit. Konark Sun Temple, Konark Dance Festival and Chandrabhaga Beach. When to go : October through March. 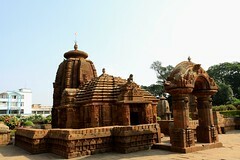 Get to the site as early as possible to avoid the hordes of day trippers from Bhubaneswar. Don’t forget your sun protection. Puri is synonymous with both Chilka Lake and the Puri Jagannath Temple. Tourists should not miss out on the chance to experience a quiet boat ride on the Chilka Lake that provides an opportunity to imbibe the breathtaking scenic beauty all around. Apart from the inland salt water lagoon, Chilka Lake, Puri has become a popular destination for national as well as international tourists during the summer season owing to its expansive Puri Beach. The city that according to mythology was once the resting place of Hindu God, Lord Krishna, also has some other popular tourist attractions like the Chilika Wildlife Sanctuary, Markandeswar tank, the Puri Museum, Temple of the Child Krishna at Indradyumna Tank, and Atharnala Bridge. If you are visiting during the month of July, you will be able to witness the Jagannath Rath Yatra when pilgrims by thousands flock to Puri to offer their devotion and prayers to Lord Krishna. The Jagannath Rath Yatra is a majestic festival celebrated with a lot of pomp and grandeur throughout the country, but specifically at Puri. Things to see and do : Jagannath Temple Complex, Rath Yatra and the annual Bring Your Own Film Festival. The parking lot is quite a distance away from the temple complex. There is a shuttle which runs between the lot and the temple. Footwear is not allowed inside the complex. Carry a pair of spare socks so that you don’t end up scathing your feet on the floor which gets heated up once the sun is up. 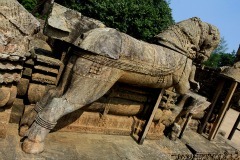 Bhubaneswar was once an integral part of Ashoka’s Kalinga Kingdom. The capital of Orissa has beautifully merged its artistic past with today’s rapid industrial development. While still bearing a strong religious influence, and as a part of the Golden Triangle of holy temple cities, which include Konark and Puri at its other two acmes, Bhubaneswar is also a commercial hub. For the art enthusiast, Bhubaneswar offers the ancient appliqué work of Pipli, cane furniture, and Ikat sarees. The city that houses more than 500 temples attracts thousands of devotees from all over the world. 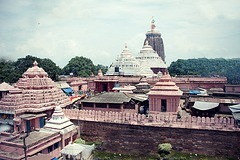 Some of the popular temples are Lingaraj Temples, Vaital Temple, Raj Rani Temple, Bindu Sagar, and Mukteswar Temple. Things to see and do : Lingaraja, Mukteshwara & Raja Rani Temple Complexes, Dhauli, Pipli, Udayagiri & Khandagiri caves. Pipli and Dhauli can be covered on your way back to Bhubaneswar from Puri/Konark. If you start early, one can complete both the caves and the temple complexes in one day.